NEW CONSTRUCTION with a November / December 2019 COMPLETION. Great location - just steps from City Park. Stunning brand new construction with quality contemporary details throughout on a large corner lot. This home is full of timeless character and quality design, paired with modern amenities. A perfect layout for today's family and entertainment living with 5 bedrooms, 4 bathrooms, and 3385 finished sq.ft. and 885 in the finished basement. 1 bedroom or study on the main floor and 4 bedrooms on the upper level, Gourmet kitchen with huge island and oversized pantry, A master suite with private deck, soaking tub and huge walk in closet, a fabulous recreation room with bar and bath on 3rd floor with a roof top patio with City of Denver and mountain views. 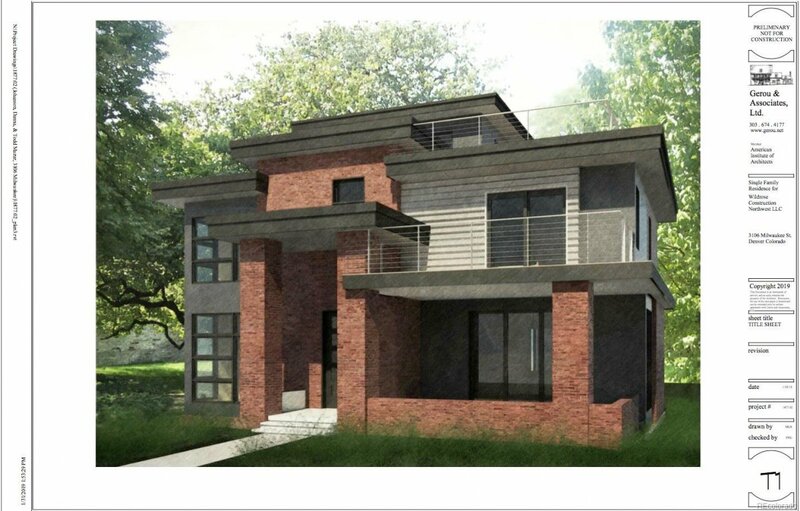 There is an OPTIONAL full ADU above the 3 car garage adding another 546 sq.ft. 1 bedroom and 1 bath, use as income or mother in law space. Designer finishes. The builder, AZCO Investments, has been building custom homes for 35 years.